In Chapter 1 of my favorite text, we learn that people respond to incentives. As this story remind us, bureaucrats are people too. Managers in the Social Security Administration, struggling to handle a skyrocketing number of disability cases, had an unusual request for their workers this week: slow down. Social Security judges and employees in Florida, Alabama, Colorado, Georgia, Tennessee, Ohio and Arizona were among those instructed to set aside disability cases this week, with the slowdown allowing managers to boost their performance numbers for the coming fiscal year, which starts Monday. Top officials, in a bid to meet goals to win promotions or thousands of dollars in bonuses, directed many employees to refrain from issuing decisions on cases until next week, according to judges and union officials. This likely would delay benefits paid to thousands of Americans with pending applications, many of whom are financially needy and have waited for a government decision for more than a year. The directive stemmed from a wrinkle in the federal calendar, in which this week fell between the federal government's 2011 and 2012 fiscal years. This happens every five or six years, as officials are allowed to count just 52 weeks in their calendar. Counting this week would make the current fiscal year 53 weeks long. That meant any applications for disability benefits completed between Monday and Friday wouldn't count toward the annual numerical targets set for Social Security judges or field offices. In Heuristic Thinking and Limited Attention in the Car Market (NBER Working Paper No. 17030), authors Nicola Lacetera, Devin Pope, and Justin Sydnor focus on the used car market and ask whether it is affected by consumers exhibiting a heuristic, or short cut, known as left-digit bias: the tendency to focus on the left-most digit of a number while partially ignoring other digits. Using data that come from wholesale auctions encompassing more than 22 million used car transactions, the authors document significant price drops at each 10,000-mile threshold from 10,000 to 100,000 miles, ranging from about $150 to $200. For example, cars with odometer values between 79,900 and 79,999 miles, on average, are sold for approximately $210 more than cars with odometer values between 80,000 and 80,100 miles, but for only $10 less than cars with odometer readings between 79,800 and 79,899. The artificially low value of the renminbi — it is 20 to 30 percent less than what it should be — amounts to a subsidy on Chinese exports and a tariff on imports from the United States and other countries. Think about this for a moment. As I discussed in this old Times column, the way China affects the exchange rate is by buying dollars in foreign exchange markets and using them to buy dollar-denominated assets (such as Treasury bonds). Yet the exact same mechanism is at work whenever any foreigner invests in the United States. All capital flows into the US raise the value of the dollar in foreign exchange markets and make our exports less competitive. Does Fred object to all capital flows into the US? Would he prefer some degree of capital flight from the US because it would lower the value of the dollar and promote exports? That seems to be the logical implication of what he is saying, but I doubt that's what he intends to suggest. So I am puzzled. A new economics blog, focusing on the economics of the digital world. Several people have asked me in recent days if the Fed's aggressive attempts to get the economy going will lead to galloping inflation to go along with our weak economic growth. It is possible that this might occur down the road, of course, but I don't see it happening just now. The slack labor market has kept growth in nominal wages low, and labor represents a large fraction of a typical firm's costs. 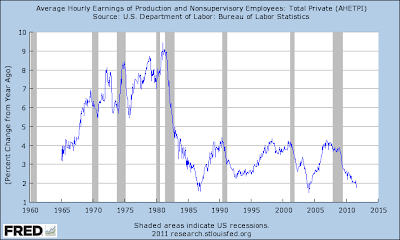 A persistent inflation problem is unlikely to develop until labor costs start rising significantly. 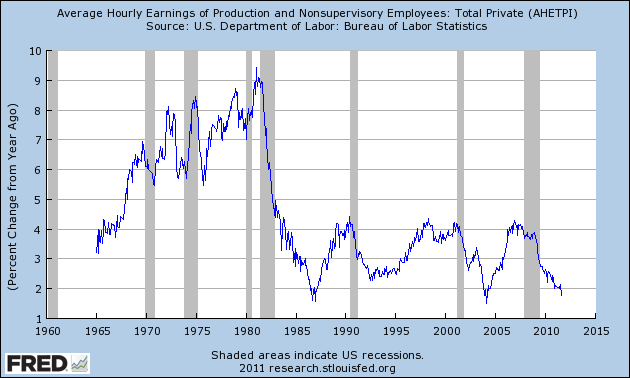 Notice in the graph above that the period of stagflation during the 1970s is well apparent in the nominal wage data. The same thing is not happening now. This is one reason I think the Fed is on the right track worrying more about the weak economy than about inflationary threats. John Cochrane on inflation and debt. Scott Sumner on monetary policy. Andrew Biggs on means testing. The Boston University economist is not a fan of the corporate income tax. With all the rhetoric floating around regarding the "Buffett rule," it might be worth trying extra hard to keep an eye on the facts. Here is the progressivity of the current tax system, according to the Tax Policy Center. If you can remember only one fact, make it this one: The middle class (middle quintile) pays 14.1 percent of its income in federal taxes, while the rich (top tenth of one percent of the population) pay 30.4 percent. Congratulations to my Harvard colleague for winning a MacArthur grant. From Joe Nocera in the NY Times. That's how many times this this blog has been visited since I started it five years ago. John wants to end the dual mandate. Disappointing, in my humble opinion, for reasons I discussed in this Times column. But not to worry: There is no chance it will become law in this congress. The proposal is about politics, not policy. If the president were serious about tax reform, he would give his full-throated endorsement to the kind of tax reform ideas advanced by the Bowles-Simpson commission that he appointed, as I discussed in this column. Virginia Postrel looks at the controversy. A moving talk from the Chicago economist. An excerpt from Silvia Nasar's new book, The Grand Pursuit: The Story of Economic Genius. Paul's comment on Robert's latest column confuses me. Paul shows a graph establishing that the investment share of GDP is procyclical, as if that refutes Robert's viewpoint about what ails the economy. But that fact is hardly a surprise. As I put it recently, "the most volatile component of G.D.P. over the business cycle is spending on investment goods." Moreover, I know Robert well enough, having been his colleague for about a quarter century, to know that he knows the macroeconomic time series as well as anyone. The problem that Paul glosses over is that correlation does not imply causation. Paul appears to jump to the conclusion that this correlation establishes that the the business cycle is the driving force behind investment spending. But it could just as easily be the opposite (or a third factor driving both). I am completely confused as to why Paul thinks this graph establishes much of anything at all. I should note, as an aside, that Robert is the second most cited living economist. That fact does not imply that everything he says is correct. (And indeed Robert and I disagree often in Harvard seminars.) But it does suggest that one should not be so glib in summarily rejecting his point of view. Click here to read my column in Sunday's New York Times. Update: My Harvard colleague Robert Barro has a related piece in the paper as well. There were 14m unemployed workers in August. 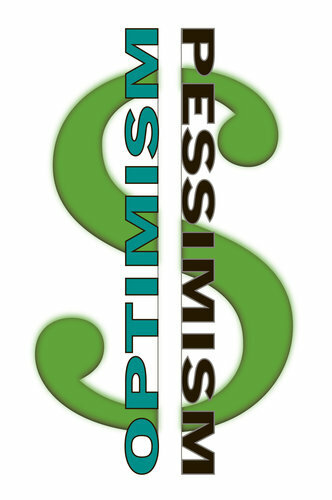 The $447b stimulus package could be used to generate a check of almost $32,000 to each and every one of them. As a condition of receiving that check, they would be asked to work at some organization, for profit or nonprofit, for one year. These jobs would last just as long as the stimulus package and some of them would no doubt turn into real jobs. Isn't this a plan everyone could support? A friend calls to my attention this quotation from Paul Samuelson. It is from a Newsweek column written in 1967, but it has some modern relevance. Of course, at the time, Samuelson was not focused on the large unfunded liabilities we now face. The beauty of social insurance is that it is actuarially unsound. Everyone who reaches retirement age is given benefit privileges that far exceed anything he has paid in -- exceed his payments by more than ten times (or five times counting employer payments)! Social Security is squarely based on what has been called the eighth wonder of the world -- compound interest. A growing nation is the greatest Ponzi game ever contrived. I was disappointed to hear the President tonight raise the canard about Warren Buffett's allegedly low tax rate. The story is, at the very least, deeply misleading. I addressed the issue several years ago in this column. Wait, wait, don't tell me. Very funny. I have mentioned this event before, but organizers tell me there are still a few open slots for this conference at the end of October. I am among the keynote speakers. 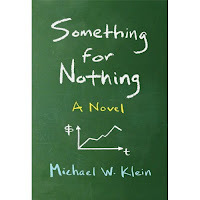 Maybe it is narcissistic of me, but I have a soft spot for novels by and about economists (a small genre, to be sure). 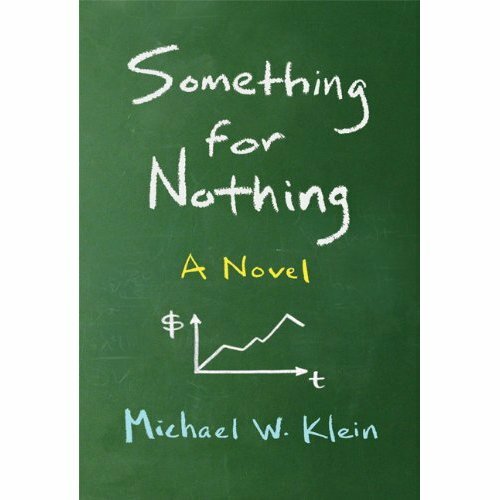 I enjoyed this new one by Michael Klein. Ed Balls is a prominent British politician. He is now the shadow chancellor, which means he is the chief economics spokesman for the opposition Labour Party. Long ago, however, he was a student of mine, as he notes in this essay on the current global economy.